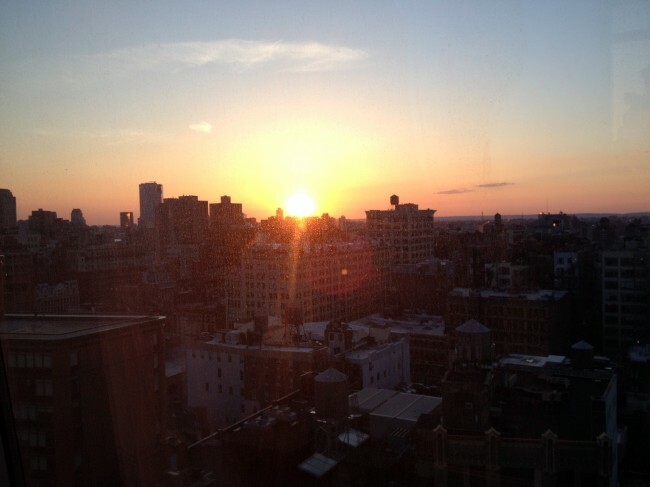 This is the very lovely sunset from our room at The Standard Hotel in the East Village. This past weekend, we left our daughter (and our home) in the care of her visiting grandparents and took off across the water to stay at The Standard Hotel in the east village for the weekend. It was, in many ways, totally glorious, despite the fact that it took me 10 minutes of continuous calling to reach the front desk on the phone so that they could explain to me how the desk lamp worked, and the sheets didn’t actually fit the (incredibly comfortable) bed. 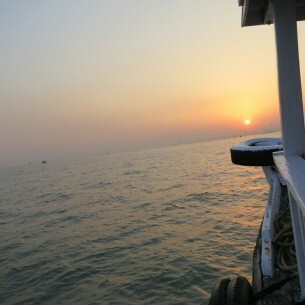 The view was mesmerizing. The bathtub was completely luxurious and the bubble bath did not disappoint. The entire look and feel of the hotel has been meticulously creative directed. The food at the restaurant was thoughtful and delicious. But I worried that our waiter might have had, ummm, too much caffeine before his shift, lets just say. And the couple two tables down was heading for a titanic-esque drunken disaster complete with knocked over tables and slurred words. But hey, that’s what you get for spending any time at all in the east village on a Saturday night. Lets just say it won’t happen again. For us mortals, this is a Tuesday night spot. And to that point, here are links to the hotels that I am going to consider for the next time my husband and I have a weekend to ourselves in the Big Apple. If I, for some reason, feel the need to stay in the same neighborhood, I’m guessing that the beds at The Bowery Hotel are properly made. Though to be honest, if I never see that section of the Bowery on a Saturday night again it won’t be a real loss, in my book. The Jane has all of the quirky secret-hideout-ness that I love in a hotel, but we would have to insist on a room with it’s own bathroom. That said, the money we saved on rates could be put to good use elsewhere, I am sure! Whenever we go to Portland, OR, The Ace is our hotel of choice. So why I wouldn’t just stay at The Ace here in NYC, I don’t know. It’s pared down, but super comfortable and the trendiness is a bit more low key… it feels like your fellow guests are actually making things, not just drinking. For just a little more money, we could head to Chelsea and stay at the High Line Hotel. Built in part of what was originally the General Theological Seminary, the building encircles a beautiful courtyard that offers a respite from the insanity of the city (rather than a direct chute into it’s midst) Plus it’s actually convenient to all the Chelsea galleries, as opposed to almost anywhere else you might stay. Or we just keep it all on the DL and stay at the almost totally secret Inn at Irving Place. Because I am very much up for getting dressed up and having a fancy afternoon tea and not running into anyone I know. I think this is my favorite of the downtown spots. I feel like I would be remiss if I did not include The Whythe Hotel on this little list. We eat breakfast at Reynard on a regular basis and the rooms are beautiful, with majestic views of the city. The only problem is it’s proximity to our actual home. It kind of kills the romantic weekend if one runs into one’s child, methinks. Or maybe we just say f*ck it, like we did last time, and head uptown to the Mandarin Oriental, which is, in my opinion, the nicest hotel in all of New York City. Hands down. Who needs cash in their bank account when you can have the memory of three glorious nights in heaven? Knucklehead-free?